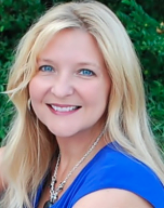 Today I am excited to have Donna Mott as my guest here on the blog today. Donna Mott is known as the “Blendermom” thrown in the mix of a blended family. On her blog www.blendermom.me which was just recently voted the 3rd top step parenting blog of 2014 on www.voiceboks.com She loves sharing her faith, her joys, and her trials of being both a biomom and stepmom. She has also written stepfamily and parenting posts for www.familyfusioncommunity.com and www.upliftingfamilies.com. Today we are blessed to have her share with us, one of her families favorite grilled chicken recipe. 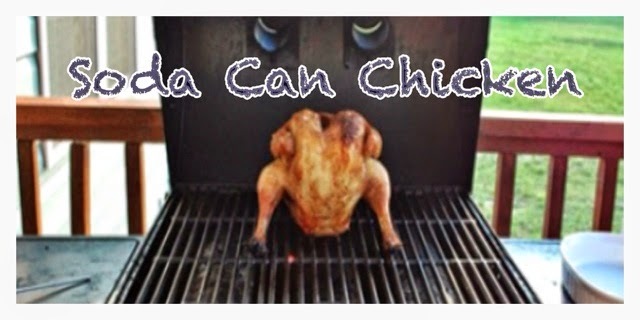 Soda Can Chicken Finding a great recipe that will feed my family of 5 can sometimes be difficult. Because the grocery store runs great specials on whole chickens, I have tried numerous different recipes and they all seem to come out the same with the outside skin of the chicken being flavorful and the meat tasting somewhat bland. That is until I found soda can chicken. This is a family favorite and it is a variation of the original beer can chicken grilling recipe. Sea Salt Favorite Seasoning (I use cajun seasoning or asian seasoning.) Enough to cover chicken + 1 tsp. First off you will need a large bowl or the kitchen sink filled with water. Take a 5-7 lb whole chicken (cleaned out, contents inside removed) and place into the water. Then pour a little vinegar in the water. (I use ~1 cup of white vinegar) Let the chicken soak in the water anywhere from half an hour up to 2 hours. Discard the water and rinse the chicken inside and out and pat dry. Cut the lemon in half and squeeze the half and rub all over the chicken inside and out. Use the other half of lemon if necessary to cover the entire chicken. Next rub the entire chicken inside and out with olive oil. Last, sprinkle the entire chicken inside and out with seasoning making sure to coat the outside well. Sprinkle salt over the chicken inside and out as well to taste. Now we are ready for the fun! Open the soda and pour out 1/3 cup. Cut a hole on each side of the opening in the top of the can to make 2 small holes. Take a teaspoon of seasoning and pour it into the soda can, but you may want to do this over the sink because it will foam up. 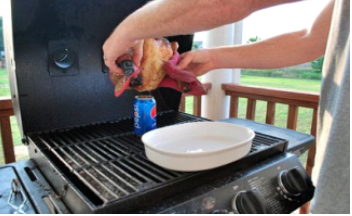 Next, insert the soda can into the cavity of the chicken and fold the wings in. 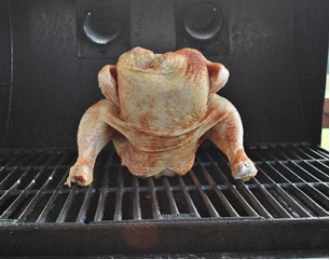 Carefully place the chicken on the grill so that it is sitting upright, balanced on the can like a tripod. Grill the chicken for 1-1.5 hours on low to medium low or until the meat thermometer shows 160 degrees in the thickest part of the chicken. Carefully remove the chicken from the can, slice, and serve. Donna loves this recipe because any flavor of soda and seasoning can be modified to your family's taste and preferences. I can't wait to fire up my grill and try this recipe. It sounds so delicious. Thank you so much Donna for sharing one of your families favorite grill recipes. Please swing by the Blendermom's site and let her know how you like her recipe. Do you have a favorite recipe? Would you like to share it with us? If you would like to be a guest blogger please contact me thru email or in comments.